Several studies on e-government have found that from different stakeholders’ standpoints, the nature of efficiency is complex and multidimensional. This study explores the multiple dimensions of e-government efficiency as a goal for e-government adoption, but from the perspective of those inside of government responsible to implement and adopt it. A confirmatory factor analysis was conducted to uncover the multiple dimensions of e-government efficiency from the perspective of implementers inside of government. The data come from a questionnaire applied over government officials who participated in a contemporary case of e-budgeting. The questionnaire includes inquiries about different dimensions of e-government efficiency found in two bodies of literature: information systems and budgeting. The results indicate a more complete structure of e-government efficiency than only the technical and economical aspects of this type of projects. 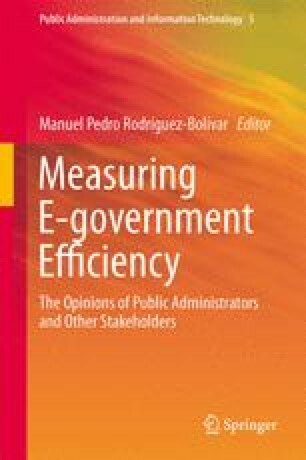 The main motivation of this study is to extend our understanding of multiple dimensions of efficiency in e-government as possible outcomes during e-government adoption from the public administrators’ view. Derived from the analysis, some practical advice is suggested.